Can you guess where is one of El’s favourite places on earth? Could it be the library, a big bookshop or a sweet shop that’s having a half price sale? Actually it’s all of those, but there is one more to add to the list – Lush! Lush is an amazing shop to visit – full of delicious smells and staff who want to be your best friend, even if you’re not buying anything. 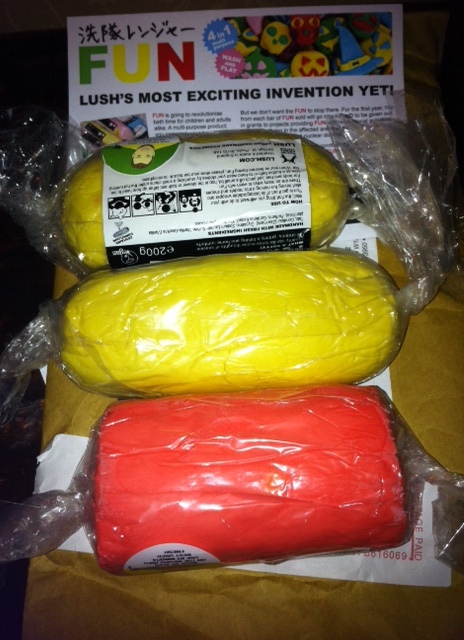 So it was a lovely jubbly day when Lush offered to send us a new product to review. And the great thing is that the new product is called Fun, and we love fun even more than we love Lush. The Lushinators sent us 3 portions of Fun, so we passed one on to our friend and fellow blogger Mim, and you can see her review over here at Mim’s Review. So what is this funny product? The best way to describe it is sort of like play doh crossed with soap. You can take a chunk of it and play with it, squish it into shapes, then use it to wash yourself. And not just yourself – you can use it to wash your hair or clothes as well. El used a little on a small stain on the leggings she was intending to wear and it worked well on the fabric with some water to remove the stain in time. It would be useful if you find muck on clothes you have set your heart on wearing and will need in 10 mins. It comes in yummy fragrances, and once you’ve used it then you will too. If you have ever walked within 5 meters of a Lush shop you will know what we’re talking about. And so will your bathroom. Each bar of Fun costs £5 but you only need a little bit so it will last a long time. It comes in lots of different colours including blue, green and the red and yellow you can see here. It doesn’t mould as well when wet and it doesn’t lather well but El has a kind of net sponge that really helps lather up soaps so that wasn’t a problem for us. 10p from every sale goes to help children in Fukushima affected by the Japanese earthquake. We recommend you get some FUN in your life! November 27, 2012. Tags: fun, Lush, soap. Reviews. I have one of those and it is fun! November 28, 2012 at 3:45 pm. Permalink.